Watching TV or surfing the internet might be easier and more convenient than ever right now, but they still require having some kind of device in front of you. That’s not very futuristic, now is it? Researchers at the University of Washington have worked out a way to implant teeny-tiny LEDs in contact lenses so we can wear heads-up displays absolutely everywhere. According to the team, the display wouldn’t require a shift in the depth of focus, and when it’s switched off it would be completely unnoticeable. There are still lots of questions to be answered about this concept, like how it will be powered and where the actual electronics will go. 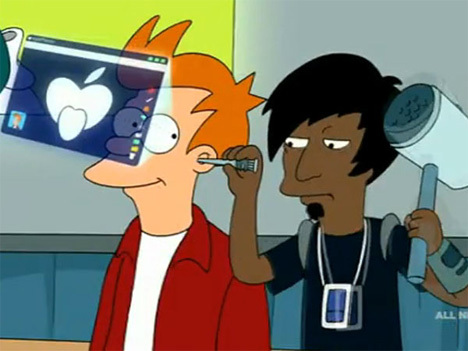 It would be interesting to integrate an eyeball-based heads-up display like this with all of our existing electronics. That way the phones, iPods and tablets could stay in our bags or pockets while we use them during a work out or a boring business meeting – and no one else will know. See more in Cybernetics or under Technology. October, 2011.